A standard manual-ignition tool that works in countless applications has one name: Solder-It SOLDERPRO 70. Equivalent to a power range of 25-80 Watts, this soldering tool is cordless, simple to use, and functions safely under any kind of conditions. Refillable with butane gas, and ready to use in 20 seconds after ignition, you can heat things up for 120 minutes on a full-tank. This light and balanced hand torch has a firm grip that gives you complete control, delivering precise work while operating a flame that ranges temperatures from 400C to 1300C (750F to 2500F). 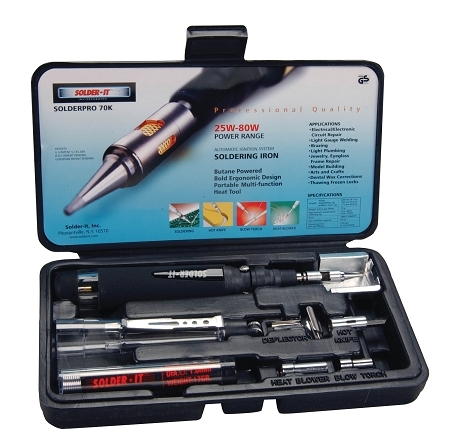 The Solder-It SOLDERPRO 70 comes with a soldering tip and protective cap, and fits perfectly with the full kit below. The Solderpro 70 Kit goes hand-in-hand with its star butane torch, the SOLDERPRO 70. 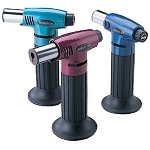 It's designed for increasing the portability and taking care of the Solder-It hand torch, and provides optional add-on functions. The heavy duty ultra-box contains: a 1mm Catalytic Soldering Tip, Torch Head for Pinpoint Flame, Hot Knife Attachment, Hot Air Blower, Tip Cleaning Sponge, and a Coil of Tin/Silver Solder. If youre looking for a great deal, this is the perfect set for soldering projects.